Patients respond differently—and unpredictably—to opioid drugs in terms of efficacy and side effects; these individual variations arise from genetic differences. Although the drugs act at the mu-opioid receptor (MOR), which is encoded by a single gene, genetic splicing gives rise to at least 20 different variants. The possibility of exploiting this diversity to develop safer opioids was the topic of a webinar hosted by PRF on January 21, 2016, titled “Safer Opioid Analgesics: It’s All in the Telling of the Tail,” referring to splice variability at the N- and C-termini of the MOR protein. Gavril Pasternak, Memorial Sloan Kettering Cancer Center, New York, US, presented a summary of the past decade of molecular investigations of MOR. A panel discussion followed with Bryan Roth, University of North Carolina, Chapel Hill, US, and Lynn Webster, PRA Health Sciences, Salt Lake City, Utah, US. The discussion was moderated by Charles Inturrisi, Weill Cornell Medical College, New York, US. The webinar was the eleventh in a new series of webinars, Challenges in Pain Drug Development, supported by unrestricted educational grants from Genentech and MedImmune. A recording of the session is available here. Pain—and pain relief—are subjective experiences that patients have difficulty describing. “This makes a readout of efficacy of drugs difficult, and has made the whole area more of an art rather than a science,” Pasternak said to start his talk. Opioid drugs also carry dangerous side effects, and researchers are working to create new drugs that minimize them. Pasternak described the Holy Grail of opioid analgesics. “It would be a potent analgesic, active against multiple different types of pain: somatic [or nociceptive], inflammatory, and neuropathic.” An ideal opioid would not produce tolerance or constipation. Its safety would be enhanced because it would not cause respiratory depression, and the potential for abuse would be diminished by the absence of physical dependence or reward behavior. “These would be a major step forward compared to many of the drugs that we’ve been using for literally centuries,” Pasternak said. Adding to the complexity of opioid analgesia, Pasternak said, is that people respond very differently to these drugs. “The relative potency and effectiveness of analgesics can vary unpredictably among patients, with some responding very well to one drug and not another, and then the next patient having a totally reversed sensitivity profile.” Patients also differ wildly in their experience of side effects, which can sometimes be avoided simply by switching to another opioid. “This variability—the inability to predict the response—has made the use of these drugs relatively complicated. There are many things that can impact the potency of drugs, and the genetic impacts are clear.” For example, genetics influences drug metabolism, which can affect drug potency and safety. But genetics also appears to impact innate drug sensitivity. “That’s a little hard to understand with the concept of a single receptor mediating all these effects,” he said. The classical MOR is a seven-transmembrane domain (7-TM), G protein-coupled receptor (GPCR) that interacts with molecules inside the cell to activate multiple signaling pathways. The molecular era of studying opioid analgesia began in 1993, Pasternak said, with the cloning of MOR. In 1999, John Pintar of Rutgers Robert Wood Johnson Medical School (then part of the University of Medicine and Dentistry of New Jersey), Piscataway, US, engineered mice lacking the promoter region and exon 1 of the gene; none of the classical 7-TM MOR protein was produced, and mice were insensitive to morphine, confirming that the classical MOR mediated morphine analgesia (Schuller et al., 1999). But things turned out to be more complicated. The primary 7-TM MOR is encoded by exons 1 through 4, but several other exons can be substituted for exon 4, producing multiple full-length, alternatively spliced variants. Exons 1, 2, and 3 encode the protein’s seven transmembrane domains as well as the drug-binding pocket, whereas exon 4 and the other downstream exons encode the variable intracellular C-terminus. “The splicing can generate unique amino acid sequences of various lengths, from two amino acids up to 58. Mice have 24 of these splice variants; humans have 12; rats have 13,” Pasternak said. Interestingly, the traditional full-length variants differ only in the spliced C-terminal region, which may be very important in transduction pathways, but not in the actual binding of the ligand. Pasternak then described a heat map illustrating the relative bias for G protein or beta-arrestin activation by some opioid drugs at various splice variants. Morphine is relatively neutral, activating G proteins and beta-arrestin similarly, while methadone skews slightly toward G protein activation. “Buprenorphine, however, really stands out. We cannot see any recruitment of beta-arrestin by buprenorphine despite its very potent activity on the G protein side. And buprenorphine does have a rather unusual type of pharmacology both in animal models and in people.” Importantly, not only do drugs differ in their signaling bias, but a single drug can vary greatly in its bias at the different splice variants. “The concept of biased signaling has a lot of potential value in drug development, and it really helps in understanding what we see with our patients,” Pasternak said. Imagine a quintet playing “Row, Row, Row Your Boat.” Suppose the trumpet and violin play very loudly, and the sax, clarinet, and bass play very softly. Now suppose the trumpet and the violin play very softly and the others play loudly. “It’s the same tune. It’s the same instruments playing the same notes, and the same musicians, but there are subtle differences.” Much in the same way, opioid drugs all work through mu-opioid receptors—the common tune—but biased signaling results in slightly different outcomes. To further complicate the matter, splice variation occurs not only at the C-terminus of the mu-opioid receptor gene Oprm1, but at the N-terminus as well, which produces functional 6-transmembrane-domain (6-TM) proteins as well as single-transmembrane-domain (1-TM) proteins that do not bind drugs but can affect analgesia by stabilizing other functional receptors. The 6-TM receptors lack exon 1 and instead depend on a promoter associated with exon 11. These 6-TM receptors account for the analgesic effects of other, non-morphine opioid drugs that persisted in the Pintar mice lacking exon 1. 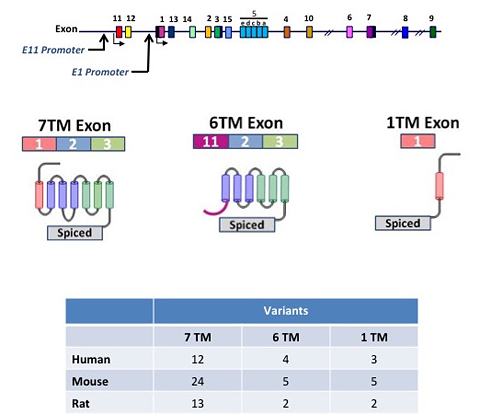 Humans make four different 6-TM variants, mice five, and rats two. In mice lacking exon 1, morphine and methadone are ineffective, but when exon 11 is removed, morphine analgesia remains intact. Conversely, removal of exon 11 renders buprenorphine totally inactive, implicating the 6-TM receptors in its activity. Pasternak then described a synthetic compound called IBNtxA, which also depends on exon 11 for analgesia and works through 6-TM mu-opioid receptor variants (Majumdar et al., 2011). Work from Jeff Mogil’s lab at McGill University in Montreal, Canada, previously showed that IBNtxA was analgesic not only in animal models of nociceptive pain but also in neuropathic and inflammatory pain models (Weiskopf et al., 2014). Subsequently, Pasternak and colleagues created transgenic mice lacking both exon 1 and 11, so that they expressed no mu-opioid receptors. Then, they injected the mice with a virus encoding a fluorescent reporter protein and a 6-TM variant of MOR (Lu et al., 2015; see PRF related news story). Three weeks following injection, the mice began producing the virally encoded 6-TM variant—expression that has been sustained for nearly a year now. “As the protein is made, the animals regain their sensitivity to IBNtxA, and the dose-response curve indicates that their sensitivity to the drug is almost the same as [that of] wild-type,” Pasternak said, indicating that the 6-TM variants are both necessary and sufficient for the analgesic activity of IBNtxA. In contrast, morphine did not produce analgesia in those animals. Not only does IBNtxA provide analgesia, but it seems to do so with far fewer side effects compared to opioids that work through the classical 7-TM MORs. IBNtxA does not produce significant respiratory depression, nor do animals show evidence of physical dependence. In a conditioned place preference test, IBNtxA was indistinguishable from saline, suggesting that it is not rewarding. Finally, IBNtxA reduced gastrointestinal motility much less than other opioids. Pasternak then returned to the topic of buprenorphine, which he called a unique compound with increasing clinical relevance. In mice lacking exon 1 of the Oprm1 gene, buprenorphine analgesia was markedly diminished but not altogether absent. However, in the exon 11 knockout, buprenorphine analgesia was totally lost. This is in contrast to IBNtxA, which requires exon 11 but is unaffected by exon 1 loss, or to morphine, which requires only exon 1. Loss of kappa- or delta-opioid receptors did not affect buprenorphine analgesia, suggesting it requires both 6-TM and 7-TM MORs. That was confirmed by the finding that injection of virally encoded 6-TM MORs into mice lacking Oprm1 exon 1 and 11 did not rescue buprenorphine analgesia, but viral expression of a 6-TM MOR in knockout mice that still expressed exon 1 did. “This has led us to consider three basic groups of mu opiates: the morphine group, which is totally dependent on the traditional, full-length 7-TM receptors; the IBNtxA group, which is solely dependent on the 6-TMs; and a larger group, perhaps, of drugs that seem to have activity that’s dependent on both, such as buprenorphine, fentanyl, and possibly levorphanol,” Pasternak said. Drugs that target the 6-TM MOR variants are potent analgesics against neuropathic and inflammatory pain as well as nociceptive pain, and they display minimal side effects compared to traditional opioids. “The side effect that is not totally lost is tolerance,” but evidence suggests that tolerance may reach a steady state in animals (Xu et al., 2015), and so it “may be something that we can learn to live with more easily than some of the other side effects,” Pasternak said. Despite the tolerance they see with drugs targeting 6-TM MORs, administering mu-opioid receptor antagonists produces no evidence of withdrawal and no evidence of physical dependence. To summarize, Pasternak said, “Cloning of the opiate receptors has permitted the transition to a molecular classification of receptors and their subtypes. For many years the opiate field has utilized selective drugs to classify receptors as mu, delta, or kappa. I would argue that those definitions need to be revised, that our definitions should be based on genetic differences, which is going to be much more appropriate and create less confusion.” Safer, effective opioids can be developed by exploiting both signaling bias and the genetic splice variants of the mu-opioid receptor, he added. During the discussion, Pasternak took questions from the panelists and listeners. Panelist Bryan Roth wondered whether mice could be “humanized” with human splice variants of MOR, considering that the variants differ between species, in order to better understand the behavioral consequences of the human variants. Pasternak said it could easily be done with injection of virally encoded human Oprm1 variants in exon 1 and 11 knockout mice, just as he had used viral delivery of a mouse 6-TM variant in the experiments described during his talk. Roth also asked what patients and doctors see as the major offending side effect of opioid drugs. It depends, Pasternak replied. In the absence of an underlying respiratory condition, in the outpatient setting, respiratory depression is rarely a major issue. It may be more of an issue in the postoperative setting, where the drugs are used at higher doses in naïve individuals in combination with anesthetics. This raises an interesting point, because day surgery—in which patients are released the same day of surgery—is becoming the norm. About 25 to 30 percent of re-admissions to the hospital following day surgery are due to inadequate pain control. “That raises the question of whether physicians are sending patients home without adequate pain medicine because they’re concerned about sending them home with medicine that can stop breathing, without that patient being supervised,” Pasternak said. “So any drug that would have less respiratory depression would enhance patient care. But to get to the real question, if you ask patients what bothers them most, they’re going to say constipation, because that’s what they deal with on a day-to-day basis,” he added. Panelist Lynn Webster said that the problem of respiratory depression is critical, because it is what causes deaths—and that’s driving the politics around opioid drugs today. “Obviously, the addiction side is very important, too, and we need to discover drugs that have neither respiratory depression nor the rewarding properties, and it sounds like IBNtxA may fall into that category,” Webster said. What makes personalized medicine difficult right now, Pasternak added, is that the genetic variation is so complex. This may involve other systems that influence opioid action or the opioid receptor gene itself. For example, different neurons in the dorsal horn of the spinal cord can express different mu-opioid receptor splice variants, which all come from the same gene, so there’s something in the neurons that defines which splice variant will be produced in that specific cell. Those factors are probably associated with the spliceosome, a molecular machine comprising RNA and proteins that guide the assembly of exons and the removal of introns from DNA to form a mature messenger RNA (mRNA) that is then translated into a protein. “The spliceosome contains a host of molecules that we haven’t really examined,” he said. The panelists concluded the webinar in agreement: Researchers are seeking the Holy Grail of opioid analgesics, but a variety of comprehensive approaches is more likely to reach that goal than development of a single wonder drug. Broad spectrum analgesic efficacy of IBNtxA is mediated by exon 11-associated splice variants of the mu-opioid receptor gene. Mediation of opioid analgesia by a truncated 6-transmembrane GPCR.